1. 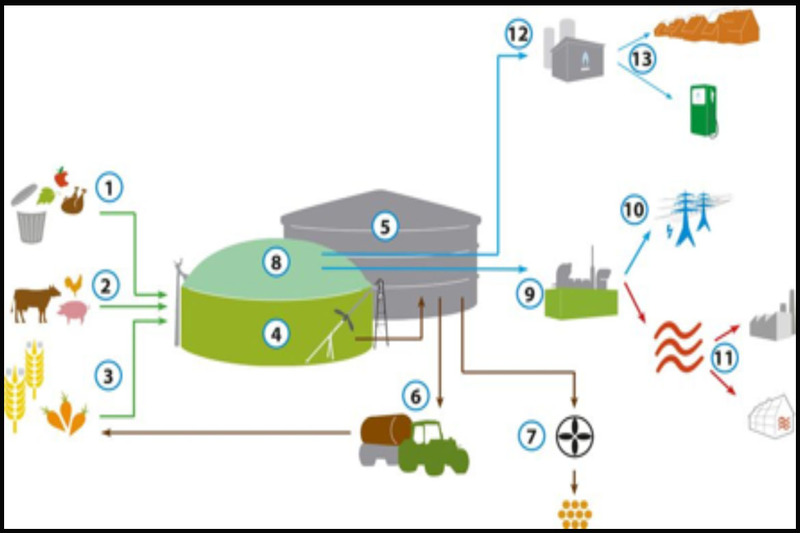 Organic input materials such as Poultry litter, industrial waste, and agro waste can be fed into the biogas plant as substrate. 2. Renewable resources such as corn, beets or grass serve as feed both for animals such as cows and pigs as well as for the microorganisms in the biogas plant. 3. Manure, litter and dung are also fed into the biogas plant. 4. In the fermenter, heated to approx. 35-40 째C, the substrate is decomposed by the micro organisms under exclusion of light and oxygen. The final product of this fermentation process is biogas with methane as the main ingredient. But aggressive hydrogen sulphide is also contained in the biogas. A fermenter made of RCC has the clear advantage that it withstands the attacks of the hydrogen sulphide and is usable for decades. 5. Once the substrate has been fermented, it is transported to the fermentation residues end storage tank and can be retrieved from there for further utilization. 6.The residues can be utilized as high quality manure. The advantage: Biogas manure has a lower viscosity and therefore penetrates into the ground more quickly. Furthermore, the fermentation residue quite often has a higher manure value and is less intense to the olfactory senses. 7. But drying it and subsequently using it as dry manure is also an option. 8. The biogas generated is stored in the roof of the tank. 9. Then it is treated to remove H2S in biological scrubber & activated carbon filters. To remove moisture content gas is further passed through gas chilling unit. 10. The pre-treated biogas is further passed through Membrane base gas up-gradation system to generate BIOCNG. 11. The Bio-CNG is fed directly to booster compressor to compress it further to 200/250 bar and then filled in to CNG cylinders / cascades for commercial usage.